Judith Hoste - Ettalong Beach Arts & Craft Centre Inc.Ettalong Beach Arts & Craft Centre Inc.
Judith has been teaching and exhibiting her work for over 20 years. 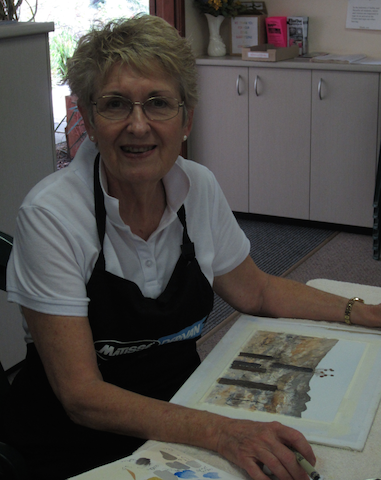 Judith commenced as watercolour tutor at Ettalong Beach Arts and Crafts Centre in 2005. She runs her classes along the lines of a workshop experience. Judith demonstrates all sections of the painting, in stages, then checks the students as they progress through the lesson. Judith was fortunate to have been shown the use of watercolours from Neville Johnston in 1988 and started watercolour teaching in 1990 as she was already tutoring in oils and pastels. Judith has been exhibiting since 1983 and has won many awards over the years. At the Great Lakes Art Society, Forster exhibition (Easter 2014) she was awarded 1st place for a watercolour painting in the “Small Paintings Section”.